When I was fourteen and had been interested in magic for a year, my mom bought me the Mark Wilson Course in Magic. At that time the oversize volume came with a close up mat, a couple of decks of Aviator bridge size cards, some gaffed cards that matched the Aviators, special Genii cards to do the tricks described in the book, and four blue sponge cubes. I could be forgetting something, but I remember those things pretty well. The course went for forty bucks – which was not chump change in seventy-seven. I thought I now had at my disposal all the secrets of magic. Only I couldn’t help but think something was missing. Don’t get me wrong, it’s an exceptional book for the beginner and some of the material – like the sponge ball routine – is superlative. But I felt it might’ve been a little too basic in some regards. I already had a year in magic, and the section on cards, for instance, didn’t present any challenges at all. I knew there had to be something more – a higher level I was missing out on. And I was hungry to learn everything I could about magic. It couldn’t have been more than a couple of weeks later that my older sister had taken me to see a movie – It’s Alive or Burnt Offerings or some such similar seventies horror fare – and afterwards we stopped by the mall. I remember doing the typical kid things – like walking up the down escalators. Funny how when you’re a kid you don’t need much at all to have fun. It’s only later that you spend lots of money – and often as not kill quite a few brain cells – trying to recapture what once was free. I was in the basement of a department store where they had their selection of books in long rows of wire framed shelves. I was checking out the books to see what they might have that dealt with magic. I’d bought quite a few magic books aimed at the general public, and usually came away sorely disappointed, but I guess I was young enough at that time to be optimistic. That’s when I saw it. The funky art deco cover seemed to grow invisible fingers which grabbed me and pulled me forward. Find money in the air, it read, with a drawing of a hand grasping a gold coin beside it. Make a red handkerchief turn green. Pour a drink from an empty jar. There was also a picture of a face with rainbow colors extending down from the right eye – an implicit promise of mysterious things, secret knowledge. And above everything the title: The Amateur Magician’s Handbook. It has to be crap, I thought, remembering other magic books bought at newsstands and in drug stores. I was still optimistic at that age, but I wasn’t a fool. I plucked it from the shelf and leafed through it. There were numerous black and white photographs illustrating things I could only barely comprehend. What the hell is this, I wondered. It was just about then my sister showed up. I had to go so I had to make a decision. Acting more on impulse than anything else I shelled out the dollar ninety-five. Hard to believe books were ever that cheap – the other night I bought a similar size paperback at Walden Books and it took the best part of a ten. I took it home, this discovery I was intrigued by but still distrustful of. I remember taking it to my room, opening it up and reading the first line: The purpose of this volume is to help you become a good magician: one who can entertain others as well as himself with the wonders he works. After that I was hooked. I can’t think of any other magic book that made such an impression – and that posed so many challenges. Henry Hay’s method of teaching was to introduce you to the sleight of hand magic first. His reasoning was simple and sound: If you learn an easy trick you’ll just run out and show people without investing any thought into how to make it entertaining. If you learn a sleight of hand trick, however, you have to put time into mastering whatever mechanics are required and will thus think about how best to present it. First up was cards, and what a departure from the Mark Wilson course it was. On page twenty-nine I was first introduced to the pass, which fairly drove me crazy for months on end, wondering how this thing could be done invisibly. Then there was the side steal, the fan force, palming, false shuffles, and on and on. But this wasn’t just a collection of isolated sleights; each sleight was explained then used in a corresponding effect. Besides being my initial exposure to advanced sleight of hand, it was also my first meeting with Leipzig, Cardini, Zingone, Muholland, Downs, Vernon and on and on. The coin section was every bit as fascinating, and sometimes frustrating, as the cards. The thumb palm, the Downs palm, the click pass, the DeManche change. It seemed like every day I could open this little book, which was a mere three hundred and something pages, and find something new and exciting. And although I bought many other books in the following years, none touched me in the same fundamental way. 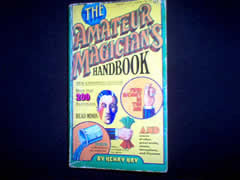 The Amateur Magician’s Handbook was my bible through my teenage years. I’ve been prattling on and on, but I think I’ve failed to convey both how good the book is and how much it meant to me. I guess non magicians wouldn’t understand how a book of tricks and theory could have such importance, but for me it was a genuine magic book. It was like any question about magic I had, I would first turn to this simple paperback book because nine times out of ten I would find my answer within. What more can I say? It’s a great book, from the opening essays through the tricks, to the advice on staging a show at the end. There’s a plethora of practical wisdom and effective tricks. I never felt Henry Hay, born Barrows Mussey, got the recognition he deserved for writing one of the best magic books ever. Maybe that’s just the way it goes. I do know I’ll always be grateful that he produced such a wonderful book that helped and taught me so much. See you next time. This entry was posted on 30 septiembre 2007 at 3:19 am and is filed under Magic Classics. You can follow any responses to this entry through the RSS 2.0 feed. You can leave a response, or trackback from your own site. When I saw the picture, I almost had tears in my eyes. This is the book that started me tumbling down the wonderful rabbit hole that is our profession. I always wondered why no one ever seems to remember who Henry Hay is. IMHO best magic book of all time.